broadband (regulation of local loop unbundling and bitstream access). The book also provides practical guidance on issues concerning the complicated market definition and analysis mechanism promulgated by the European Commission's Recommendation and Guidelines. Introduction. Privatization Liberalization Regulation Competition. Structure of this Book. Part I. The Evolution of EU Telecommunications Policy and Law. 1. The Transition from a Regime of a State-run Monopoly to a Liberalized Market. Part II. 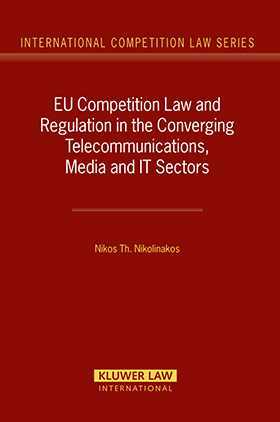 The Application of EU Competition Policy and Law to the Electronic Communications Sector. 2. Access Agreements Refusal to Supply and the Essential Facilities Doctrine under EU Competition Law. 3. Specific Issues of Competition Law. 4. Strategic Alliances and Mergers in the Converging Telecommunications, Media and IT Sectors. Part III. Adapting the Telecommunications Regime to the Emerging Multimedia Environment The EU Electronic Communications Framework. 5. The Challenges of Convergence to Regulatory Approaches Nature and Scope of the Regulatory Regime. 6. The Competition Directive. 7. The Framework and Access Directives Imposition of Specific Remedies. 8. The EU Authorization Framework for Electronic Communications Networks and Services. 9. Universal Service Provision End User Rights. 10. Data Protection, Security and Confidentiality. 11. The Impact of the EU Electronic Communications Framework on the Broadcasting Sector. 12. EU Radio Spectrum Policy in the Converging Environment. 13. Market Definition and Analysis of the Relevant Markets. Part IV. Specific Issues: EU Audiovisual Policy / Broadband. 14 . EU Audiovisual Policy Content Regulation. 15. Broadband.